Launch Franchising, LLC. is pleased to announce the opening of its tenth indoor trampoline park. The new and tenth park is located in Milford, Connecticut. Over the past four years Launch Franchising, LLC has rapidly expanded over the East Coast and plans to continue to expand nationwide with ten more openings scheduled by the end of the year. Launch Franchising, LLC. (Launch) was founded in 2012 in Warwick, Rhode Island. After taking a family vacation in Florida, Robert Arnold, co-owner and president of Launch, had a vision of bringing a fun alternative way for both kids and family to stay active to the east coast. Soon after, Robert Arnold paired up with co-owner and three- time Super Bowl champion, Ty Law to make his vision a reality. In just four years, Launch has brought family fun, and health and wellness to various locations spread across the east coast from Massachusetts, Rhode Island, Connecticut, North Carolina, Georgia and more. With Launch’s tenth opening right around the corner, the trampoline park co-owners have no plans on slowing down Launch’s expansion. 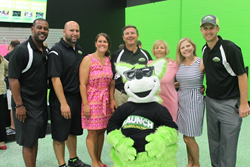 Launch Franchising, LLC brings year-round destination centers of connected trampolines that create one giant jumping surface for children and adults alike. With different sections such as dodgeball courts, Launch pads, slam dunk basketball courts, foam pits and more, Launch brings jumping fun for everyone. In addition to Launch’s various jumping opportunities, the Launch Arcade is available for friends to challenge each other in some of the most popular arcade games. Launch creates a safe, friendly and fun environment for everyone, making Launch the perfect place to host your next social gathering whether it be a birthday party, a team building event, or a fundraiser. Furthermore, Launch’s very own mascot, “Joey”, a 7-foot tall green kangaroo is available to assist with birthday and special events hosted at the park. Ty Law and Robert Arnold are co-owners of Launch Franchising, LLC, with two corporate locations in Warwick, RI and Hartford, CT, and franchise locations along the east coast. The company is expanding its franchise nationwide and utilizing the strength of positive branding, turn-key operational systems and proven marketing programs as attractive benefits to potential franchisees. For additional information, please visit http://www.launchtrampolinepark.com.